The first thing to try is to adjust the door latch. Some stoves have a mechanism to adjust the door as the gaskets compact through use, and others can be adjusted by bending the hook welded to the stove body. If you can't adjust the door, or if after adjustment the bill pulls out easily in one or more places, you should replace the door gasket because once it is compressed too far, no adjustment can produce a good seal. This view shows both the door and glass gaskets. 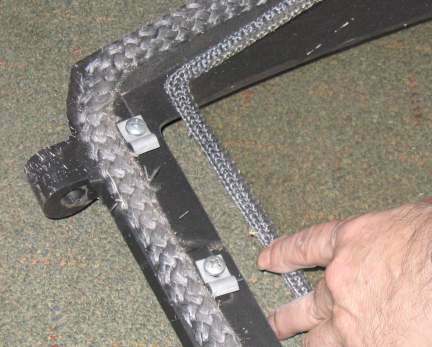 It is a good idea to replace them at the same time.Gasket material has evolved over the years from asbestos rope to fiberglass ropes in various sizes and densities. The usual gaskets are 3/8" to 1" thick. If in doubt about what size and density to use, remove the door and take it to a wood stove store to test a variety of gaskets in the groove. The right gasket may be cut to length from a large reel or packaged by the manufacturer in a kit for your stove. Cement to hold the gasket in place is often included in kits. You can purchase gasket cement in a small tube or tub. If you can't find gasket cement don't despair. You can use common silicone sealant in a caulking tube. Some have said that silicone hardens the gasket sooner than stove cement, but that's not a clear consensus, so don't be afraid to try it. High temperature silicone is not necessary because the temperature rating of household grade seems to work well enough. To install the gasket, remove the door and place it on cardboard or cloth to prevent scratching of the finish. Pull out the existing gasket; on some stoves you'll have to disassemble the door to get the gasket out. Clean the gasket groove with an old screwdriver to remove any lumps of old cement. Clean the groove thoroughly with a wire brush and/or course steel wool to produce a clean surface for the cement to stick to. Using the cement or silicone, apply a narrow (usually 1/4" to 1/2" wide, depending on gasket size) bead along the entire groove. Lay the gasket in the groove without stretching or bunching it, starting on a long straight part of the groove. Cut the gasket slightly long so that the ends can be tucked into each other forming a good seal. Press the gasket into the cement. Here is the glass, with gasket installed, being mounted in the door frame.The glass must be sealed tightly to the door to prevent air leaks. 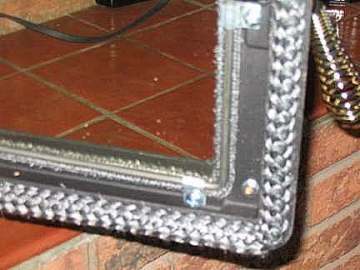 This is normally done with a flat woven gasket, usually with adhesive on one side. Clean the glass before installing the gasket. Remove the paper backing from a length of gasket and lay it on a flat surface, sticky side up. Center the edge of the glass along the gasket and press it into the adhesive. Now rotate the glass and press the next edge into the next length of gasket. Repeat until you get back to where you started and cut the gasket to the right length. Now wrap the edges of the gasket around the edges of the glass. The glass gasket may need replacement as often as the door gasket, but this depends on the design. If you see brown streaks on the glass coming in from the door frame, it usually indicates the need to replace the glass gasket. A good airwash system should keep glass clear for weeks of full time use. Most stoves built since the mid-1980s that have ceramic glass panels in their doors also have a air-wash system. The air-wash system supplies most of the primary air to the fire through a narrow slot along the top inside edge of the glass. The objective is for the combustion air sweep down between the glass and the fire so that soot cannot stick to the glass. Good airwash systems are remarkably effective at keeping the glass clear. When combined with seasoned fuel and good operating technique, these systems can keep the glass door clear for weeks of 24/7 operation. After a period of use, a white or grey haze forms on the glass. The haze is easily removed with a damp paper towel when the stove is cool. Light brown stains that form at the lower corners of the glass can be removed with a special wood stove glass cleaner by following the product instructions. Dark stains are difficult to remove and are a sign either that the stove has a poor air-wash system or the fuel is wet or the stove is being turned down too much. Smouldering fires and damp fuel are the most common reasons for dirty glass. You can work at keeping your glass cleaner by following the stove operating suggestions in our tips section. Dark stains can be made easier to remove by burning very hot for a couple of load cycles. Do not use abrasives on door glass. Some people recommend using a razor blade to remove black stains from ceramic glass, but this will almost certainly scratch the material because it is much softer than regular window glass. Other people use a small amount of light ash on a damp paper towel for cleaning glass. The objective, however, should be to run the stove or fireplace so that the only deposits are white or grey and are removable with a damp paper towel. Stoves have been painted with high temperature paint since the 1970s. Good stove paint is widely available and will withstand high stove temperatures. Spray cans of stove paint can be used to touch up your installed stove to make it look like new without removing it to a shop. Let the stove cool down first. Mask those parts not to be painted and protect everything around the stove from over spray with large sheets of cardboard or paper. Most stove paint dries to the touch in about fifteen minutes. Some stoves are factory enameled, a finish that cannot be added later. Enamel is very tough, even under heat stress, but can be damaged by chipping. Touch up and enamel filler kits may be available from stove dealers. Cast iron stoves are built from several separate panels which are held together with long threaded rods that clamp sides, front and back between the top and bottom. As the stove is assembled at the factory, stove cement and sometimes gasket is placed in the joint and compressed as the rods are tightened. The owner's manual usually suggests breaking the stove in over time with a few fires. These increasingly hot fires soften the stove cement in the channels allowing the cement to fill every crevasse, thus ensuring air tightness. If a cast stove is moved from its original location cracks in the cement can develop, meaning that the stove will leak air and be harder to control. If a cast stove leaks too much air, and the gaskets are in good shape, it should be torn down, cleaned and rebuilt with new stove cement in the grooves. Rebuilding a cast iron stove is a big job that if not done right, can result in more leaks than it had before tearing down. Unless you are well prepared with good advice and a full set of tools, have a dealer do the rebuild for you. Firebrick is used in many wood stoves to protect steel or cast iron while increasing firebox temperatures for better combustion. Modern EPA certified wood heaters often use a lighter, lower density brick for higher performance. When replacing such brick it's important to replace with the same brick type to maintain your stove's efficiency. Cracked firebricks, which remain in position, do not have to be replaced immediately. The bricks in most stoves and furnaces are a standard size, which is half the size of a normal house brick. They measure about 4 1/2" x 9" x 1 1/4" inches, and are referred to as firebrick 'splits'. Standard splits can be purchased at some building supply stores, but the special low density bricks found in some EPA certified stoves must be purchased from a wood stove dealer. Baffles in wood heaters reflect heat towards the fire, increase the length of the flame path and create a chamber for secondary combustion, all of which are essential for clean burning and high efficiency. They may be stainless steel, cast iron, firebrick, ceramic fiber board or a combination of these materials. Since they are exposed to flame on both sides, baffles get very hot and will deteriorate over time. Removal and replacement is usually detailed in the owner's manual. For mainstream stoves, replacement parts can be ordered from a stove retailer or directly from the manufacturer. Cheaper stoves may have baffles that are not replaceable, meaning that the stove is ruined when the baffle fails. Some horizontal baffles include a ceramic fiber blanket, which usually lies on top of the baffle. During maintenance and cleaning, this blanket must be pressed down flat so that it doesn't block the area above the baffle where the exhaust flows. Ceramic fibers should be treated like asbestos; airborne particles should not be inhaled. Wearing a respirator is recommended when doing this kind of maintenance. The term refractory means a material that can tolerate high temperatures and is usually in the form of firebrick or ceramic fiber. Some stoves use custom-cast refractory components using ceramic fibers for a secondary combustion chamber. These are usually white or off-white material and may be very soft board-like material or a hard masonry material. In either case they should be handled gently. Avoid breathing any dust created by handling. Repair may be possible in cases of breakage in some cases. Replace when necessary with factory-supplied components. Stainless steel air tubes are used at the top of the fire under the horizontal baffle in many modern EPA certified non-catalytic stoves. The intense heat in this location can cause them to sag or disintegrate in time. The tubes are removable by undoing the fastener or turning to unlock the keyed ends. Replace with factory parts and new fasteners. Catalytic elements deteriorate over time, generally lasting 12,000 hours or about six years, if they are cared for properly. Your owner's manual gives directions on cleaning, inspecting and replacing them. EPA standards dictate a six year prorated warranty, which you should be read to understand how to care for the combustor. You can check the condition of the catalyst by watching the smoke at the top of the chimney. There will be smoke as the stove heats up but it should decrease dramatically or disappear completely when the catalyst is engaged. Structural welded steel plates, such as sides, back and top, that warp may be unsightly, but as long as there are no cracks, the appliance can continue to be used. These parts of welded steel stoves are not replaceable so if they crack or badly distort it means the body is not suitable for continued use and should be recycled. Cast iron may warp or crack through time, but it's usually a sign of severe stress caused by overfiring, often due to leaks in joints between castings. Interior parts may be replaced with manufacturer-supplied parts. Exterior parts can be replaced during a complete teardown and rebuilding.